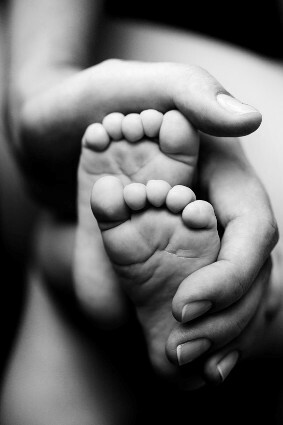 Performing a simple, gentle Ayurvedic massage for your baby is a lovely way to promote relaxation and improve bonding. Baby massage is an ancient custom in India, the home of Ayurveda, and is considered to provide many physical and emotional benefits to the growing child. These include reduced stress levels, improved bonding between parent and child, the development of healthy sleep patterns, and promotion of skin health. According to Ayurveda, baby massage may continue until the child is old enough to perform self-massage, or Abhyanga, which we have described here, which may become a life-long practise. Most practitioners would advocate starting massage after around 4 weeks of age, when the baby has gained strength, and after the navel has healed. The palms, rather than the fingertips, should be used to ensure gentle pressure is applied, and the touch should be very light. You can massage at any time of the day, but preferably not immediately after feeding or when the baby is hungry or distressed. Many people like to massage their baby in the evening just before bath time to promote a deep relaxing sleep. It is important to stop the massage if the baby is not enjoying it. Carry out massage in a warm, draught-free place, on the floor or a table, covered with a towel or blanket that can be washed easily. Traditionally, you would sit on the floor with legs straight out, and support the baby between your legs. Turn off the tv and radio, and talk or sing to your baby while you perform the massage. Use a certified organic oil for massage. The traditional massage oil in Ayurveda is sesame oil, which is warming and nourishing. Other good choices are almond, jojoba, coconut, camellia or macadamia oils. Avoid at all costs mineral-based oils which are petroleum-derived, may contain toxic contaminants, and do not nourish the skin. Many people like to carry out a patch test with the oil on the baby’s arm a day or so before applying to the whole body, to ensure there are no sensitivities. Essential oils and oils containing perfumes or synthetic ingredients should not be used on babies. Read about safety issues with essential oils here. Warm the oil to body temperature by standing the container of massage oil in warm water – test the temperature on the inside of your wrist before applying it to your baby’s skin. Make sure your baby is calm and relaxed when you perform massage. Begin with the baby lying on her back, and apply the warmed massage oil to the limbs and the whole front of the body in long, sweeping strokes. Massage the crown of the head in long circular clockwise strokes. Massage around the ears and side of the head in large circular motions. Massage both shoulders in circular motions clockwise, and then up and down the arms, then the palm and back of the hands clockwise. Massage along the length of each finger. Massage the chest very gently. Massage up and down the legs, and then the feet, using a clockwise circular motion with the thumb over the soles of the feet. Turn the baby over onto her front, and massage the back of her head in a large circular motion. Massage the back very gently up and down in long gentle strokes. Massage the buttocks using a circular motion. Massage up and down the backs of the legs. Place your baby onto her back again and massage the face very gently. Use circular motions over the cheeks, use a finger to massage along the jawbone from the centre of the chin up to the ear, and then in long strokes across the forehead from one side to the other. If you are already familiar with Abhyanga, you will notice that this massage is based on the full Abhyanga procedure designed for adults. On completion of the massage be aware that your baby will be slippery with the oil – wipe away any excess oil and wrap her in a towel before bathing or dressing her. She will now be ready for a long, relaxed sleep! Make it part of your daily routine and enjoy the benefits for you and your baby. As a parent, be sure to look after yourself - carrying out Abhyanga is a great way to give back to yourself during the physically demanding years of early parenthood.